After working through my birthday, as is the case with most years, Linda decided to plan a birthday weekend getaway from August 11th through 13th. This isn't our first birthday adventure trip and you can check out some past trips like Fredericksburg day 1 and Fredericksburg day 2. 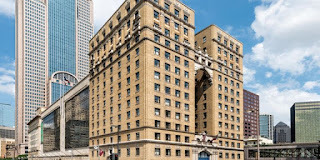 Our base of operations, which we didn’t even spend much time in, was the historic Hotel Indigo, which is in Downtown Dallas. Because of its age, the hotel feels small and the rooms/hallways are tiny. In addition, don’t expect any free meals, but they do have a small restaurant and bar, which are pretty good albeit expensive. Overall, it’s a nice hotel that wants to be upscale but feels a little older. 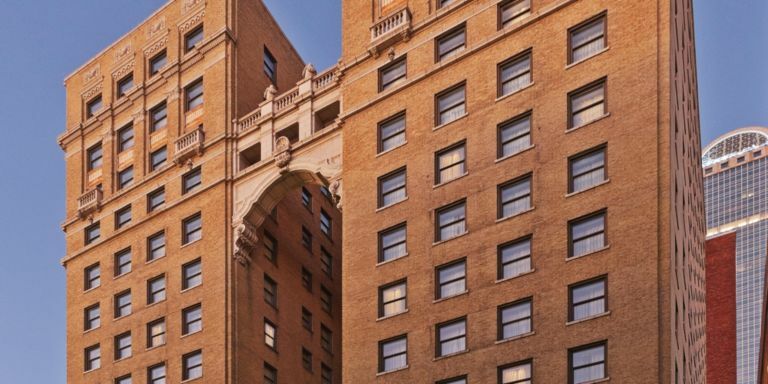 The Indigo Hotel was built in 1925 and 89 years old. In addition, this is actually the first hotel to bear the Hilton name. Furthermore, Hotel Indigo was once the site of the Dallas Opera House and the Titche-Goettinger department store. Finally, if you are looking for spooky places, it's rumored to be haunted due to its long history. The next morning, we woke up, ate a quick bite in the hotel restaurant, and took a short Lyft ride to Dealey Plaza. We made the incorrect assumption that the bus tour was somehow affiliated with the Sixth Floor Museum. An employee set us straight and we walked to a small kiosk in the plaza across the street. We checked in and had a small chat with the odd kiosk employee who provided 0 details on how everything worked. Having no instruction, I wandered around Dealey Plaza while Linda, thankfully, found the bus we needed to get on. We eventually loaded up and were on our way with the tour. A little surprisingly, the driver is not the tour guide and ours didn’t add anything extra to the trip. Instead, the tour is prerecorded and our driver had to occasionally time location with the story. If you are looking for a tour that stops, lets you out to take pictures, this isn’t that tour. At least in my experience. Our trip started in downtown Dallas as we learned about the events leading up to JFK’s visit and the plan for JFK’s motorcade and how it changed last minute. We then traveled a short distance to visit some key Lee Harvey Oswald sites. We passed by the hospital where JFK and Oswald spent their last hours. A little bit further down the road, we took a brief stop at Oswald's Rooming House. People currently live there, but they have a small sign in the front yard that says you can schedule “appointments”. Next stop is the site in the Oak Cliff neighborhood where Oswald tried to walk away from the assassination site and where he ended up murdering Officer Tippett. We also learned how bystanders were able to use Tippett’s radio to report the murder to the police. Finally, in this area of town, we passed the Texas Theater where Oswald eventually apprehended by the Police. For the final section, we learned some history on Jack Ruby and headed back to downtown Dallas. We passed by some of Jack’s old business and the Dallas police headquarters building, which is where the ramp Jack walked down to kill Oswald. Lastly, we headed down the Main Street route that the JFK motorcade before ending back the former School Book Depository Building (Sixth Floor Museum). After a quick lunch, we made our way back to the Sixth-Floor museum. The museum was originally the Texas School Book Depository but is now the Dallas County Administration Building. The museum looks at the life and death of JFK using an audio guide and some short movies sprinkled in. It was hard to move through the museum because it was packed and quite a bit of information was fresh from the bus tour. However, standing in the spot Oswald fired his shots was very surreal and a unique experience. After a free dinner from Hotel Indigo, we headed off to a downtown Dallas ghost tour. Dallas is one of the older cities has a ton of haunted places and ghost stories. The tour is a mix of a pub crawl and ghost stories. The general premise is to walk to a bar in or near a haunted building, grab a drink, and then settle in for some history and ghost stories. The tour was ultimately fun, but I went in with my expectations set high from previous tours and your guide was very energetic, over the top, and frequently went for the easy scream scare. While Nightly Spirits ask that you don’t directly share their stories, I will list the locations we visited so you can do a little research. The first stop was Frankie’s Downtown in the Davis Building, Money Alley, Press Box Grill in the Wilson Bldg (it stormed hard during our time here), Pegasus Plaza, and the Rodeo Bar in the Adolphus Hotel. After another night in Hotel Indigo, we headed off to our final destination: Trinity Treetops Adventure Park. It’s an aerial obstacle course reminiscent of Army obstacle courses from my past except you are harnessed in and at least 10 feet in the air. There are 6 courses of various difficulties and all are self-guided. Once you are hooked in, you move at your own pace through the lane until completion. Linda and I were the first ones there, so they trained us up and set us free, which worked in our favor because a Girl Scout Troop showed up a little after us. I fired up my new FITFORT 4K Cam and we started out on Green which is the second easiest. 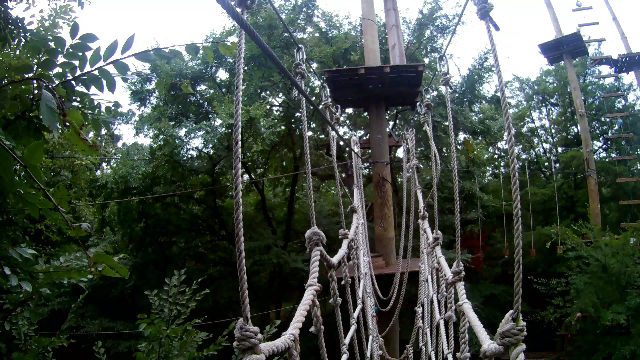 Green was various types of aerial bridges with ziplines sprinkled in. 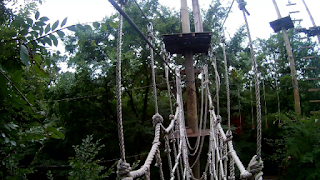 After that, I moved on to the 2 blue courses, which involved similar obstacles and ziplines; however, these were twice as high, harder to balance on, and tougher to navigate through. I briefly considered trying the hardest, black, lane, but I was far too tuckered out and had to call it quits. I’d love to hear your experience and adventures from Dallas, so go ahead leave some suggestions below in the Comments. Also, if you like the blog follow us on Facebook to keep up to date.